A luxurious life on the mountains can be yours when you live in Saddlewood. This is one of my favorite neighborhoods in Summit County and I can give you plenty of reasons why I like it here so much. Located alongside the Snowflake Run, this area of Breckenridge has a lot to offer, including scenic landscapes, privacy, access to great outdoor sports and a dynamic downtown. Saddlewood is a true ski in and ski out community so you can enjoy the mountainside right outside your door. There are also acres of forest for hiking and lots of mountain biking trails. In addition, residents can take advantage of complimentary bus shuttle service. So whether you want to browse the shops downtown or you’re looking to go to the base of Peak 7, the shuttle bus can take you there. The townhomes in Saddlewood are as impressive as the scenery. These 3 or 4 bedroom units have the finest detailing throughout. Each kitchen is spacious with stainless steel appliances and granite countertops. The living rooms are equipped with gas fireplaces and there are also separate family room areas. Plus, the master suite has a jetted tub. So you have the room for guests while benefiting from some private time as well. Want More Info on Saddlewood? As you can see, Saddlewood has many wonderful features. So if you’re interested in checking out this development in person, let me know and I can set up a tour that works with your schedule. I’m also available to search for other Summit County listings that might suit your living needs. In fact, if you’d like to see a lovely condo development in the Breckenridge area, feel free to read my recent blog about Los Pinos. That’s also another neighborhood I highly recommend. 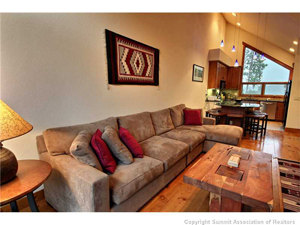 I’m open to showing you any Summit County home that meets your needs. So don’t hesitate to let me know exactly what you’re looking for in a property. Or, if you’re looking to sell an existing home in Summit County, I can also help you through that process from beginning to end. Feel free to contact me at your convenience. You can send me an email at [email protected] or call my office lines. However you wish to get in touch with me, please know I would love to assist you in any of your real estate needs.